Until all mankind, without exception, undergoes a great change, wars will be waged, everything that has been built up, cultivated, and grown will be cut down and disfigured, to begin all over again after that. A little over seven years ago, on a crisp and crystal-clear summer night here in the mountains of southern New Mexico, my life changed forever. While passing time during a break from my normal astronomical observing program, I happened upon a dim patch of light crawling slowly through the stars of the constellation Sagittarius. 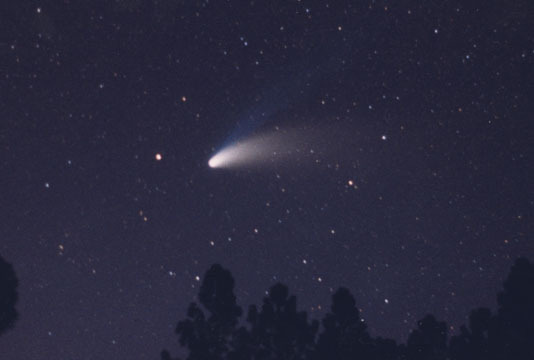 A year and a half later, that object, Comet Hale-Bopp, blazed in the nighttime skies of Earth, becoming one of the brightest comets of the 20th Century. More people viewed Comet Hale-Bopp than any other comet in history, and for a little while at least, mine was a household name around the world. 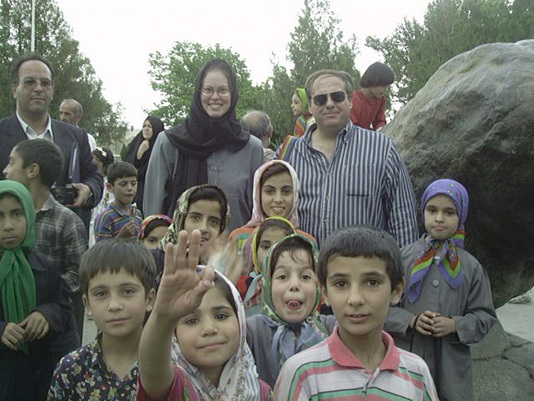 At that time I challenged myself, and my fellow residents of planet Earth, to use the power within ourselves to build a world for the 21st Century that is free of war; that is free of hatred; that is free of ignorance and superstition; and that can confront, and overcome, the many challenges we face. In my book, in my published statements, and in my various talks, I urged everyone to enjoy and appreciate the spectacle that nature was then providing to us, and then asked them to imagine building that world I have just described. In my concluding words of my book Everybody's Comet, I pointed out that that world "begins with us, here, today." Over five years have elapsed since Comet Hale-Bopp was shining in our nighttime skies, and it has now receded into the dark outer depths of the solar system. Life here on Earth, meanwhile, continues on, and we are now in that 21st Century of which I so often spoke. But we haven't quite built that peaceful world yet, and in fact we seem to have fallen much farther from it than we were when I first issued my challenge. New wars seem to sprout up on almost a continuous basis, and we appear to be drowning in a deluge of hatred, of ignorance, of destruction. At times it seems that any hope for a peaceful future is drowning alongside us in that same flood. But I believe we are better than that. In 1961 then-U.S. President John F. Kennedy challenged us to commit ourselves to the goal of landing humans on the moon and returning them to Earth before the end of that decade. Despite enormous scientific and engineering challenges, and seemingly overwhelming odds against us, in July 1969 humanity accomplished this goal. We did this -- because we believed we could do it. A quarter-century ago humans launched two spacecraft called Voyager towards the outer planets of the solar system. Despite a never-ending stream of difficulties, a dedicated team of thousands -- of which I was privileged to be a part for a couple of years during the mid-1980s -- nursed these two spacecraft on an incredible journey by the outer planets, in the process returning to us photographs and knowledge beyond our imagination. The two Voyagers are now leaving the solar system, as humanity's emissaries to the stars. We accomplished all this -- because we believed we could do it. During my lifetime we have made enormous progress against many diseases and physical ailments that were once thought incurable, and we have made great strides in unlocking the mysteries of life itself. We have built a transportation system that can deliver any one of us to any location on the planet within a day. We have developed a system of communications that can put us into contact with almost anyone, almost anywhere on this Earth, almost instantaneously. All these things, along with many other incredible achievements, we have accomplished -- because we believed we could do them. We can build a world that is free, once and for all, of the wars, and of the hatred, and of the ignorance, that have overshadowed us ever since our barbaric past. We can build a world where our disputes and grievances are resolved peacefully, without resorting to violence. We can build a world where everyone, regardless of race, or of nationality, or of skin color, or of religious beliefs, or of sexual orientation, is treated with dignity and respect, because they are human beings. We can do this -- if we believe that we can. We can develop a society where every individual, and especially every child, regardless of where they live on this planet, is fed, is clothed, is housed, is protected from disease, is educated, and is given the opportunity to live happily and to make his/her own contributions to humanity. We can eliminate poverty, and restore dignity to every human community. We can do all this -- if we believe that we can. We can create a world where the air we breathe is clean, and where the water we drink is pure. We can develop the means to create the energy we need to run our society, without destroying the environment in which we live. We can preserve the beauty and sanctity of our Earth, not only for ourselves, but also for all the other living things with which we share our planet. We can do all these things -- if we believe that we can. We can leave our Earthly cradle, and expand out into the limitless universe that surrounds us. We can understand, and learn to mitigate, the natural disasters that sometimes befall us here on Earth. We can succeed in our quest to understand the hidden mysteries of life, and how it operates, and in the process eradicate the diseases that still continue to afflict us. These, and many other things, we can do -- if we believe that we can. Writing the above paragraphs was easy. Accomplishing those things described within them will be enormously difficult; the technological, and sociological, challenges are many, immense, and complex. Some, of course, will say that I'm being idealistic, and perhaps they're right. But what is the alternative? Do we strive to create the best world we possibly can? Do we utilize the power within ourselves to build a just and honorable society for all of us? Do we reach for the very stars themselves, and someday reach them? Or do we allow ourselves to sink and drown in a hopeless flood of hatred and ignorance and destruction? That choice is ours. And no one is going to do the hard work for us; that's our job. Hale-Bopp is gone, but meanwhile, a new light approaches. A little over a year ago the Near-Earth Asteroid Tracking (NEAT) program, based in California, discovered a comet out beyond the orbit of the planet Saturn. 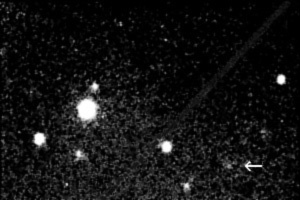 Right now Comet NEAT is almost exactly the same distance from the sun and Earth as Hale-Bopp was when I discovered it, and it can be seen as a dim patch of light crawling slowly through the stars of the constellation Fornax. In April, May, and June of 2004, however, Comet NEAT will be near the sun and Earth, and should be shining brightly in our nighttime skies. Like I did with Comet Hale-Bopp, I would like to challenge my fellow residents of planet Earth to go out at that time and gaze up at Comet NEAT, and resolve to use the power within us to create the world I have described. Unfortunately, though, we just don't know how bright Comet NEAT might become. It might rival, perhaps even surpass, the spectacle presented to us by Hale-Bopp, or it might be much dimmer, to the point of not being visible at all, or it might be anything in between. We will just have to wait and see what nature presents to us this time, as we have no control over the brightness of Comet NEAT, or Hale-Bopp, or any other comet. But we do have control over the brightness of our own future. Let us seize this moment; and build that world for ourselves, and for all the generations that will follow us.